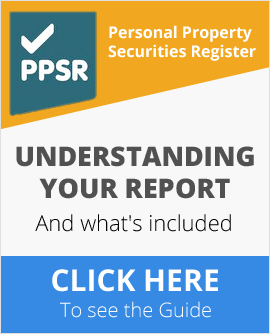 Buy with confidence with an Official Australian Government REVS Check (PPSR) report! Prior to purchasing a used car, motorbike, truck, trailer or caravan, buyers should complete a REVS Check. As of January 2012, the REVS Check has been replaced by the Australian Governments PPSR Check system known as the Personal Property Security Register. Searches conducted on Australian vehicles now incur a fee of $14.95 and can ensure your vehicle has not been written off in an accident, is not listed as being stolen or is under finance (encumbrance) with a financial institution. Reports are issued via email to your nominated email address during checkout (or your PayPal address should you checkout with PayPal) usually within several minutes of you ordering. It is imperative your enter the correct VIN (Vehicle Identification Number) as refunds or replacement REVS Check certificates cannot be issued for such errors. The REVS Check system is unavailable on Wednesday evenings between 9 PM and midnight each Wednesday for routine maintenance. Checks conducted during this time are placed in a queue and processed once the system becomes live.